Man, truly an end of an era that we are not likely to see again. What can you say about Rob Gronkowski? The dude was a nightmare to gameplan, tackle and cover. The duo of him and Tom Brady were among the likes the league was not ready for. While there are countless highlights that you can choose from, here are some of my personal favorites that show just how unstoppable he was. October 26th, 2014, the Pats had a 51-23 blowout against the Bears with Brady throwing 5 TDs, 3 of them to Gronk. This one in particular just shows Gronk absolutely man handling safety Ryan Mundy on his way to a score. That was one of those moments where I remember exactly what I was doing when I saw it and just couldn't believe it happened. Not only can you not cover this man with a safety, but if you try, he'll just rip him off like its nothing. November 16th, 2014. In another blowout win over the Colts that will be remembered as the Jonas Gray game, Gronk added yet another highlight to his resume. Again, Gronk making me see that and go "what the hell just happened?" 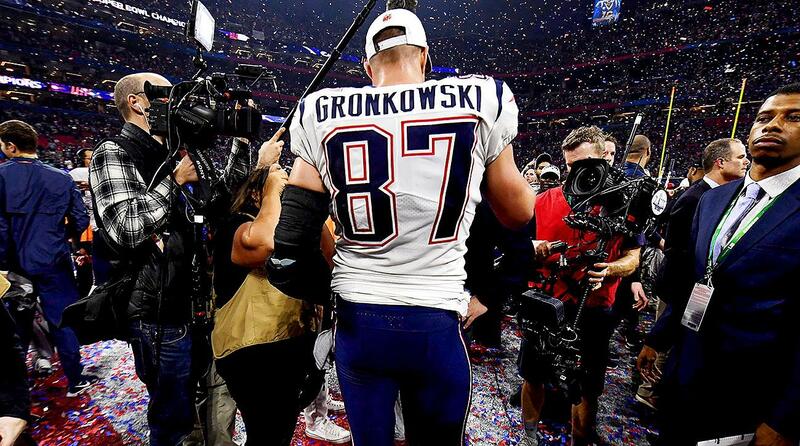 When healthy, Gronk was the best tight end in NFL history, and I will back that statement to the end of time. Arguably one of my favorite characteristics of Gronk was his personality. After that insane play, Gronk was on the sidelines dancing and going "I don't even know how I did that! I juked like 5 people!" It also seemed that when the Pats really needed to, they would just have these plays where Brady could go to Gronk and it would never fail. In a tightly contested game in Pittsburgh in 2017, Brady went to gronk 9 times for 168 yards and this 2-point conversion. He gets the 2-point with little contention and proceeds to point and laugh at Sean Davis just letting the world know that you can't guard him. This has gotten rather long, but it just shows how insane Gronk was for his time here and all he accomplished in only 9 years. There are so many more too, his clutch plays Super Bowl 49 and the list goes on. Even in losses he was a nightmare. The AFC Championship loss to Denver with no runningbacks and Edelman with a broken foot, Gronk went 8 for 144 and a score when there was no one else to guard. At the end of the day, I love that man and everything he did for the Pats. Congratulations on one hell of a hall of fame career and enjoy retirement my man!